The best way to stay out of trouble, if you're a shimmery, color-changing little squid, might be to paint on some pretend testes. Scientists have found that certain female squid can switch on and off a body pattern that makes them look male. They use a never-before-seen cell type to do it, and it may be all for the sake of keeping the actual testes owners far away. The opalescent inshore squid, Doryteuthis opalescens, lives in the Eastern Pacific and is one of the main species caught for food in the United States. So you'd think someone would have noticed its trick before. But the animals shift their colors all the time, and no one seems to have paid much attention to a certain bright stripe particular to females. 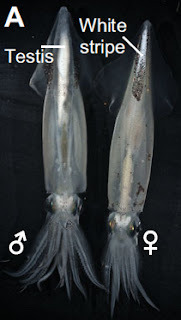 Daniel DeMartini, a graduate student at the University of California, Santa Barbara, "observed the female squid rapidly switching the stripe on and off," says his advisor, Daniel Morse. He decided to gather a few hundred D. opalescens squid in laboratory tanks and watch them work. DeMartini found that females can opt to turn on a bright white stripe on their mantles, highlighted by a line of iridescence on both sides. This happens to look pretty similar to a male squid's testis, which—in his less colorful moments—is visible as a long white shape inside his transparent body. The authors speculate that female squid might use this stripe as a disguise when they want to avoid harassment by males. "In this species of squid, mating occurs in dense assemblages of animals, with the females subject to repeated bouts of mating by multiple males," Morse says. By switching on her white stripe and mimicking a male, a lady squid might be able to fend off some of these mating attempts, protecting both herself and any fertilized eggs she's carrying. Morse is less excited about this act of deception, though, than he is about the cells that squid use to pull it off. Within the white stripe region, specialized cells hold proteins called reflectins inside many spherical packages. These proteins start out colorless. Upon receiving a signal from the brain, the packages shrink into dense blobs. The varying sizes of the blobs make them reflect all different wavelengths of light, so that the cells as a whole appear bright white. It's the same way we humans make white paint, Morse says: small, dense particles of titanium dioxide are suspended in the liquid, and the combination of different-sized particles ensures all light waves are reflected at once. 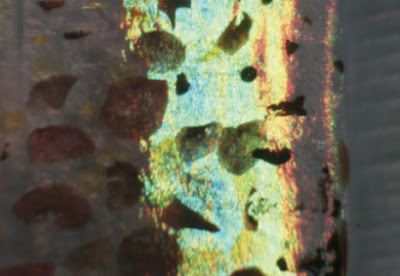 Earlier, the authors found reflectins in the same squid's color-changing cells. Instead of turning from transparent to white, these cells can move between many different colors. In this case, "the reflectins are packed in accordion-like folds or pleats in the cell membrane," Morse says. When the brain tells the proteins to clump together, the accordion folds close up—and depending how far they close, the cells will reflect different wavelengths of light, from red all the way to blue. It's fitting that squid have ten arms, because this one seems to have a surprise up every sleeve. 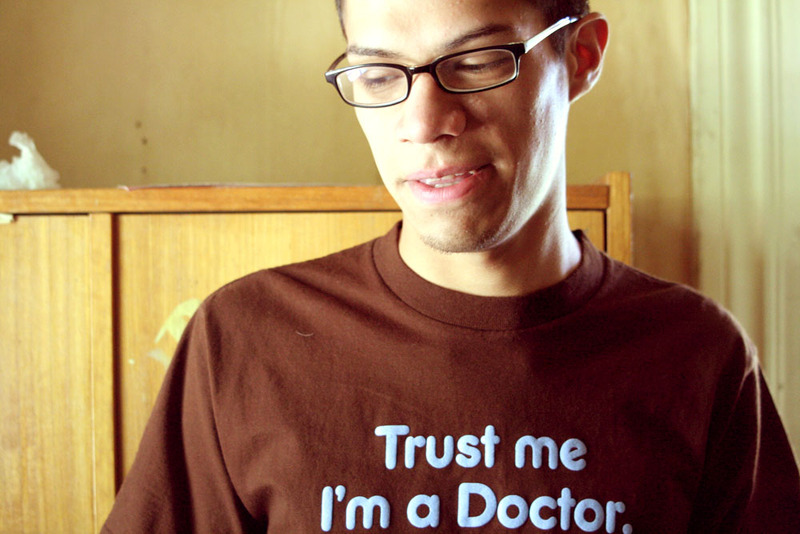 As to whether it's still hiding anything more surprising than fake testes, we'll have to wait and see.